Let’s start with the truck/main image. There are actually lots of pieces. I first cut the Whisper White CS base with my Coluzzle. I stamped the truck with Versamark ink on the Whisper White CS so I had a light outline and to guide with placement. I stamped the lady and flowers with Stazon Jet Black ink. Used Aqua-Painter to color in with Groovy Guava, Mellow Moss, Ruby Red, Close to Cocoa, Blush Blossom and River Rock Classic Stampin’ Pads. Colored center of flowers white with my white uni-ball Signo Gel Pen. Applied Crystal Effects to the flowers. I put Pewter Jumbo Eyelets to where the tires should be with my Crop-A-Dile tool. Next, I stamped the truck on Papertrey White CS with Stazon Jet Black ink. Used Aqua-Painter again to color the truck in with River Rock ink. Cut out. Made an antenna with pewter wire from Wire Works (what am I gonna do with this item retired…but I see it all throughout the new collection???) and adhered to the back of the truck with Mini Glue-Dots. Now, you know how I am:) I had to make the windows appear realistic, so I used a Transparency Sheet (acetate) to create the windshield. And the drivers window is 1/2 down and I placed some reflection lines on it with my white uni-ball Signo Gel Pen. Added a single cute little puppy to the back of the truck with the flowers. He was stamped with Stazon Jet Black ink and colored in with Close to Cocoa ink leaving a white patch around one of his eyes:). 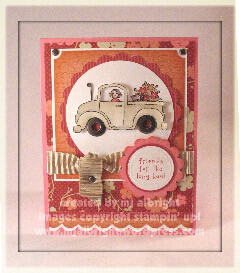 Attached in place with Stampin’ Dimensionals (using the Versamark stamped line as my guide). Card base is Regal Rose CS 4-1/4″ x 11″ folded in half (card front 4-1/4″ x 5-1/2″). Ginger Blossom DSP 4″ x 4-3/4″ (flower pattern). Scalloping to bottom made with 3/16″ Corner Rounder punch and 1″ x 4″ pieces of Whisper White CS and Groovy Guava CS stamped with Weathered BG stamp and edges sponged with Groovy Guava ink. A strip of Ginger Blossom DSP 3/16″ x 4″ (stripe pattern). Main image is Whisper White CS created with Coluzzle (5th circle from center). Scallop behind main image is Ginger Blossom DSP (stripe pattern) created with Coluzzle (6th circle from the center) and used 3/16″ Corner Rounder Punch for scalloping…can see the DSP in the center of the Jumbo Eyelet wheels. Groovy Guava CS 3-1/2″ square stamped with Weathered BG stamp, edges sponged with Groovy Guava ink, and Ticket Corner Punch to upper corners. Whisper White CS 3-5/8″ square with pewter brads from Vintage Brads Assortment to upper corners. Stamp sentiment with Ruby Red ink on Whisper White CS. Used Classy Brass Punches Plus Embossing Template to create a dry embossed circle around it. Punched out with 1-1/4″ Circle Punch. Punch out a Ruby Red CS circle with a 1-3/8″ Circle Punch. Use Scallop Punch and Regal Rose CS, sponge edges with Groovy Guava ink..set aside. Wrap ribbon around all these layers before attaching to card base. I used ribbon from Beachfront Ribbon Originals and tied in a knot. I took the pieces and pulled them down and attached to card with a pewter brad from Vintage Brads Assortment. Now you can attach Scalloped sentiment with Stampin’ Dimensionals. Hope you like and TFL. Wow! You are truly talented! I love the card! I have the set, yet, I don’t think I can be as creative as you! Love the window! Wonderful card! This is just the coolest – especially with the window?!?!! Now you are thinkin’ girl!! TOO COOL!!! This is totally AWESOME! I just love all your details. I just love your creative mind. Not only did you do this awesome card with all the details…..you took the time to write it all down. WOW WOW WOW…YOU ROCK! oh my word that is unbelievable! Way too cool! How great is this?? I LOVE the acetate windshield and window!! This is so completely adorable! The eyelet wheels and acetate windshield are just genius!! TFS! WOW, you continue to amaze me with your beautiful cards!!! Your attention to detail and all the “little” extras are just totally amazing!!! Wow! That’s incredible! Great card!!! I love this! Great use of LOTS of stuff! Mary Jo, you really brought a fresh new look to this stamp set! I LOVE, LOVE, LOVE this! Your attention to detail is just amazing! I love the acetate sheet for the windows and the pewter jumbo eyelets for the wheels. Ingenius! This was a must have set for me too! It’s so cute and yet I’ve not inked it up in a while … thanks so much for breathing new life into it. Oh that window is fabulous!!! I think I need to use this set for Valentines Day this year. I know right where it is and with some sparkly hearts I’m all set. Thanks for the push in the right direction! WOW! 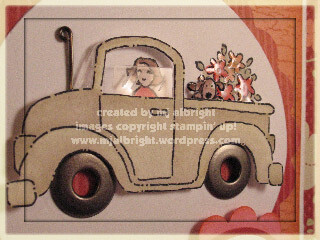 I love the window on the truck, the detail on the flowers and the overall card is fantastic! Great job on this card. What an amazing piece of artwork! Wow! You really did breathe some new life into this old set! Great job! Like yours, my set has been sadly neglected too! I especially love the little window you added to the truck, excellent! WOW!! Mary Jo Im glad youre not my demo I would be broke!LOL! I have never been a very big fan of Loads of Love except for the accessories but WOW have you changed my mind! Oh I LOVE your truck! With the window 1/2 down! TOO CUTE!!! Oh this is FABULOUS! You are too much! Windsjield and windows! WOW! Oh my goodness, this is the cutest card! I love how you used the jumbo brads for the wheels and made the window! You are so dang clever! You have me inspired to break out my Loads of Love set!! It’s one I will keep forever I think! Hope all is well in this new year! Oh! I love the wheels! Love the window!!! This is really great! I love the way your mind works! Loads of Love is a fav of mine too and i don’t think I’ve used it enough. omg!!!! this is cute!!!! love it !!!! What an adorable card and genius idea for the window!!!!! WOW!!!!!!! I love it. I have this set and really like it but haven’t used it forever. Now I TOTALLY want to CASE this card. It is so adorable. You are fabulous 🙂 Thanks!!!!! What a great card! Boy…are you good! I absolutely love the window! I really don’t care for this set too much. But you sure can even make sets I don’t like look like I NEED them! Awesome card! Mary Jo, that is the most phenominal card I have ever seen. I can’t believe you gave that truck a window! You really just raise the bar girl! Your details on this are nothing short of amazing!! I love this!! Oh my gosh, I love that you gave her a “window”! Fantastic! I am SO impressed with all your extra special details, Mary Jo! This card is over-the-top terrific! So glad I stumbled onto your magnificient blog over the weekend for the double-SU scallop punch technique. This is my 1st update, and you are now one of MFTs (pun intended). Oh so cute and clever! I’ve never seen the truck look so dimensional! Very inspiring design!